Peggy Schwier may be the gardening pro, but those are husband Bob’s dahlias and don’t forget it. Everyone has snippets of memories of gardens or flowers in their lives. And what a grand glorifier the passage of time can be. I’m sure that the rambling roses that I remember scrambling up the side of our house were leafless and mildewy by August, but what a memory I have of them! I have a vivid memory of hollyhocks and bachelor’s buttons. I remember the black ants on the Festiva Maxima peonies with the red flecks on their emerging buds. There were red Sweet William next to them. Edit out the weeds. I remember watching Making Things Grow with Thalassa Cruso on public television on hot summer afternoons as a twelve or thirteen year old. She was a gutsy, no-nonsense Englishwoman who, with cleaver in hand, would call the shots on any houseplant. A Julia Child of the gardening world, she was a real hoot. You might have predicted I would become a professional garden designer and gardener by my watching back then, but I didn’t know it. I went instead to art school, where I started as a sculpture major but graduated with more of a mixed-media focus, with particular emphasis on movement and dance. Dance is still a passion: I’ve been dancing, choreographing, taking classes, and teaching with Vineyard Dance since 1974. Even with the landscape design business, I see myself as moving shapes, colors, and textures through spaces. In fact, each work day I lay out the traffic pattern of my crew, as well as the pots and plants, and consider it all choreography. Schwier’s own garden in bloom. The truth is, despite my childhood afternoons with Thalassa Cruso, it wasn’t until the 1980s that I found myself becoming a true Vineyard gardener. A lot happened back between 1980 and 1985 that changed my life forever. I met my husband, Bob, who owned a charming little half cape on Longview where he planted tulips and daffodils in the fall and they’d bloom in the spring. He planted dahlias in spring and they’d bloom in the summer. He had cold frames next to the house where he started zinnia seeds for the summer garden. I thought that was so advanced. 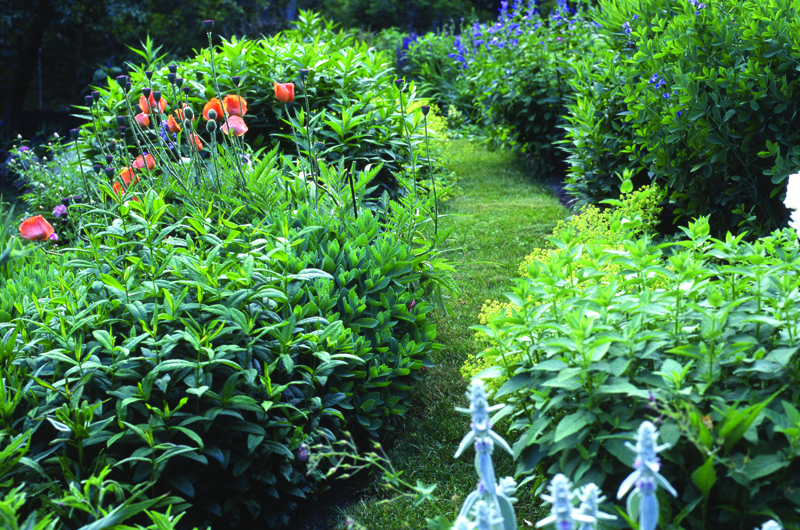 Around that time I also met an outstanding landscape designer named Edwina Von Gal, who came to Edgartown to work for a mutual client and built a wonderful cottage garden there (it was the early ’80s after all). That is where I really caught the garden bug big time. I loved the color themes, the varieties of plants, the hardscape, shapes, textures, and the way you could direct people through these spaces. She was a wonderful, whimsical person, with a great perspective on everything and a great sense of humor. Topping it off, Bob and I went to England to visit friends in 1985 for ten weeks on a belated honeymoon and a whole world of gardening opened up to me. That has become a regular trip for the last thirty years. Last fall we went for almost three weeks and went to sixteen National Trust properties and also many private gardens. My own gardening started in those years. Bob and I built our house in 1983; back then he would return from a trip to the landfill with rocks that had been strewn around by the excavators. He used them to build the retaining walls, and we continued to expand and better the soil over time. The original perennial border was almost more of an identification garden, as I got more and more interested in trying out new plants. I learned the hard way by starting way too many flats of seeds, of way too many plants, all lined up on planks in the living room windows. They were too leggy at first, or there were too many plants to move in and out of the house when I was trying to harden them off. Ridiculous, as I look back, but I needed to learn what was too much, I suppose. 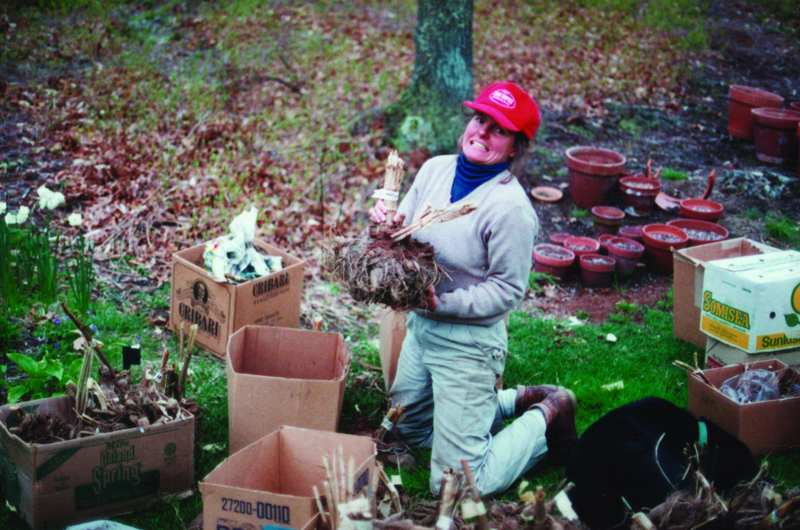 At work cleaning dahlias in 1990. We shuffled and re-shuffled over the years to regroup plants and change or enlarge the groupings. I’ve never liked dead ends, so I made paths to be able to move through the spaces and get different vantage points. I added a border behind the main border as a backbone to the garden, for added dimension, and a wide grass path. When I added the last row of plantings behind the others, I thought I’d be mad if I created something that needed much more maintenance. So I put low-maintenance plants there: peonies, boxwood, bayberry, inkberry, hydrangeas, roses, and ornamental grasses. (I love Calamagrostis because it’s very vertical and can be placed next to a path. You get these beautiful striations that you can see through – in my case, the tree trunk of a large beech tree.) A veggie rectangle is at the end of it. It is directly behind the herb garden in the front row. It has worked well to give a great 3D effect. What absolutely changed my life, however, was the day I decided to clear a path winding throughout our entire three-and-a-half-acre property. So frequently we look out at our land only from within the house to the wooded areas around it. Other than a cross-country hike into the thicket in the wintertime, we don’t live in the whole property. A path through it all is so expanding, walking through the beetlebung grove, the beeches, huckleberry, and oaks. The path tells you where to go. An added dividend is that it gives access to many prolific highbush blueberries that, frozen, serve us into the new year. There are particular pleasures of living with and caring for the same garden over the course of decades. Many faces of people come to mind when looking around the garden, like the two Festiva Maxima peonies I got from a White Flower Farm gift certificate for our wedding thirty-two years ago. It’s the same for the Raspberry Sundae peony, the iris that Tommy and Lisa divided and gave to us at our wedding, and the blue Rose of Sharon. All thiry-two years old. Then there’s the dark-blue hydrangea I bought at the florist about thirty years ago, blooming blue at Easter for a photo shoot of a client’s house. It was not supposed to be hardy, but I planted it and it lives on. The lavender I started from seed thirty years ago didn’t have a fun winter last year, but some remain. Even if you are not sentimental, the garden tells tales of where you’ve been, who you’ve known, what you’ve dabbled with, and who you are. It is inevitable. After several years of messing around in my own garden, I took on a couple of others. It started with a woman from Washington, D.C., for whom I did everything from correspondences and arrangements, to shopping, to serving dinner, and most important, doing her dinner table settings and flowers around the house for her large and frequent dinner parties. I thought I had found my calling. FLORIST! I planted a forty-by-sixty-foot picking garden at the farm near our house and grew every kind of annual possibly grown here, from seed, along with about one hundred dahlias. I sold little bouquets at the Gourmet Shop and elsewhere. I did one or two weddings every fall. I built a collection of antique pitchers, vases, bottles, enameled teapots, and made hardware cloth racks to dry deadheaded petals so I could make potpourri (remember, it was the ’80s) and oh, how little money I made for the time and worry involved! But also around that time, friends of friends of friends started calling me for advice to make sense in their gardens. 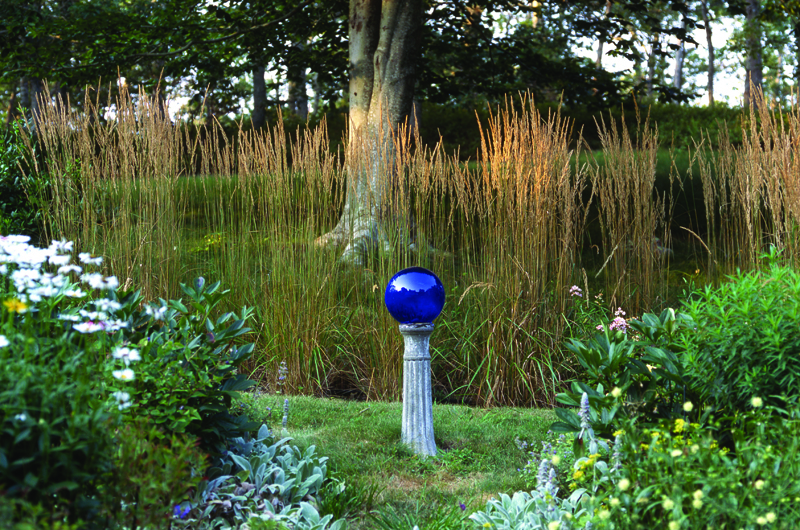 The mid-’80s, it turned out, was the beginning of a gardening renaissance on Martha’s Vineyard. Part of it was simply that irrigation became more generally available on the Island, which enabled one to plant beyond the hose bib. Now you had the ability to protect your investment in a plant or a border with water. That made a huge difference in what you could do. So, between my excitement about gardening and the new trend to create gardens beyond one rhododendron here, one juniper there, a tomato plant and a few marigolds here and there, the gardener within me was unleashed and my business was born. Paths, through a garden or through uncultivated portions of a property, draw a person forward through the landscape, adding dimension to the experience. With bigger and more elaborate gardens, of course, came more problems with deer. We tried all kinds of remedies, starting out with Irish Spring soap tied to stakes all around the garden. Then we bought vials to fill and refill with coyote urine, alternating between wondering and not wanting to know how they got the stuff in the first place. That was messy business; you’d be gardening and knock into the vial hanging in a bush and get splashed with dead fly soup. There were all kinds of waxy, oily, smelly concoctions that did or did not work. Deer are an aspect of gardening on the Island that hasn’t changed all that much. Though there are some non-messy, not terribly smelly deer and rabbit preventives that work reasonably well, it’s still a constant battle. As my client list grew, I began to realize that I needed a philosophy to deal with the problems I was often called in to help solve on a property. Too many landscapers at the time were saying yes to anything their client wanted, and I often found wrong plants plopped in the wrong places. I felt strongly about creating landscapes that would last, and about connecting people to their property. I took classes at the New England Wild Flower Society – conservation biology, wetland ecology, and others – so that I could better stand behind what I believe and better inform my clients. Pretty much everyone, I’ve discovered, whether long-time resident or new arrival, would like more of a connection to his or her landscape, to the Island. And with a broader perspective invariably comes a fuller feeling of responsibility to the Island and a better understanding of its uniqueness. So what should you ask yourself when you look at your land? First of all, I tell clients, before even starting to think about plants, that it’s important to work through why you want something here or there. I try to help them figure out their original motivation for changing what’s already there. Only then can you ask what can be done to best solve the puzzle. Also, with every decision you are creating some kind of maintenance requirement. It’s not necessarily bad to have more maintenance if you love gardening yourself or can afford to hire someone else to do it, but it’s important to consciously decide what the minimum is that will accomplish the underlying goal of your garden or landscape. For instance, one can still create a somewhat formal landscape and use native material that requires very little upkeep to survive and thrive. Second, choosing your more cultivated areas carefully is very important. I always tell clients to think in concentric circles. The closer you get to the house, the more you are able to fuss. Slightly farther away, you might control shapes and textures with low-maintenance natives. Finally, you just don’t mess with the outer circle. In other words, I am not the type to put impatiens around a rock at the end of a long drive. That said, I don’t feel I have a particular “signature” other than that I’d like to think that my gardens look like they belong on the Vineyard and to the person who owns them. I’m frequently called to new houses where the property was finished by a landscape architect and asked to perform a “landscape repair,” to make it look individual, more like the people who own it. It’s not that landscape architects don’t know what they’re doing – they usually do. But often as building costs soar, the budget for the landscape gets cut. Or the client doesn’t have the chance to visualize the landscape, or doesn’t find that the landscape is a priority until the construction dust settles and the new building looks suddenly like it doesn’t quite fit into the landscape. In the early days of my garden design, I made elaborate sketches for approval, with the plant names and how many and where. The client often couldn’t grasp what the plants were and what the sequence of bloom would be, so they’d just say, “well, sure!” As much as any contractor wants to hear “well, sure,” I learned along the way that to really solve landscape needs, I should start by asking a series of questions. Just looking at a house usually tells me something about a person’s style and aspirations, but conversation is what empowers people to take ownership of their gardens. The most important questions, for both clients and do-it-yourself gardeners, are general: How do you want to feel in your space? 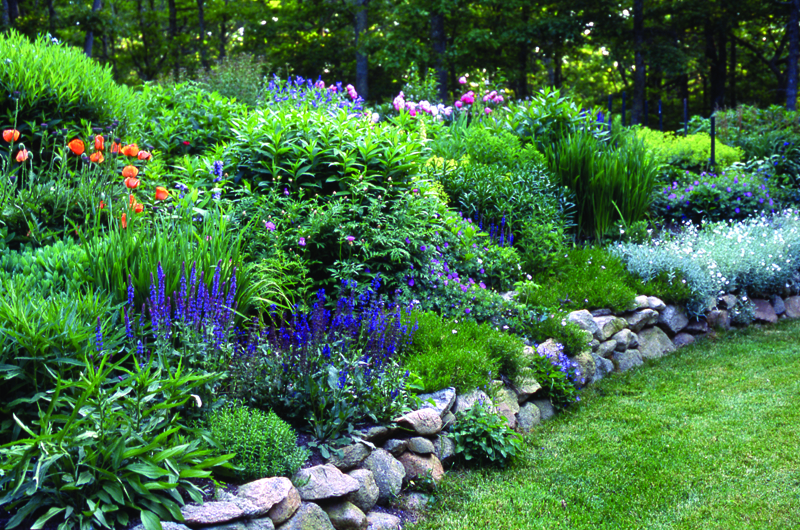 What do you want your landscape to do for you? What does the Island mean to you? What characteristics are most important to you? Then you can move onto more garden-specific questions, such as how much structure, how loose, how calm, how colorful? What do you want to see looking out from each individual space? What are examples of things you like? With those questions answered, or at least prodded, we can begin to shape a landscape. I feel equipped to create clients’ spaces and can walk them through the characteristics of the plantings as we walk around the building. The transitions from one to the other. How to make it look like it just happened instead of screaming “new landscape!” It’s kind of frightening, really, but I’m best able to do it that way. Sometimes I wish I had someone to sensibly talk me through the dilemmas of first-time property ownership way back when Bob and I first moved onto our new land. After fifteen years of moving at least twice a year, I could finally call someplace my own. I wanted to do something with it, in it, something, anything. Because I could, because it was mine. I purchased so many things and stuck them into the edge of the woods and they disappeared. I wish I’d had a little more sense than to waste the time and money, but I felt that I needed to plant something, even if it did last only a couple of years! If I were to have a chat with a new landowner now, I’d tell him or her to take time to get to know and understand what you’ve already got. See it, learn its contours and what plants are there. Spray yourself with some DEET and go for a walk. Don’t be in a rush; don’t waste money; see how you’ll use the property. Get to know your landscape – wildflowers, natives – and tame them if you’d like, add to them perhaps, integrate them. Whatever you do, don’t clear-cut the land! See what the required setbacks are for the house and septic, and whether you can save some existing trees and bushes. How many times have owners cut everything down and then asked me to bring back the highbush blueberries, the Clethra, or other natives? Have them frame your landscape. Most of all, enjoy the process, not just the result. Building a garden is an evolution. Sometimes a slow one, but it’s important to go through the process. Understand that the landscape is ever-changing, and that the garden will start to evolve the minute you put it in. Plants will tell you where they like it, or more likely where they don’t. I personally won’t order veronica any longer, because my garden soils are so oomphy with yearly compost that they rot out. After replacing a plant for two years in a row, you must realize you have the wrong plant for the space or soil. So, listen. Take time to think of your individual spaces and then decide what to put there; don’t go to the nursery and say, “I’ve always wanted a stewartia.” (I just planted mine about five years ago.) 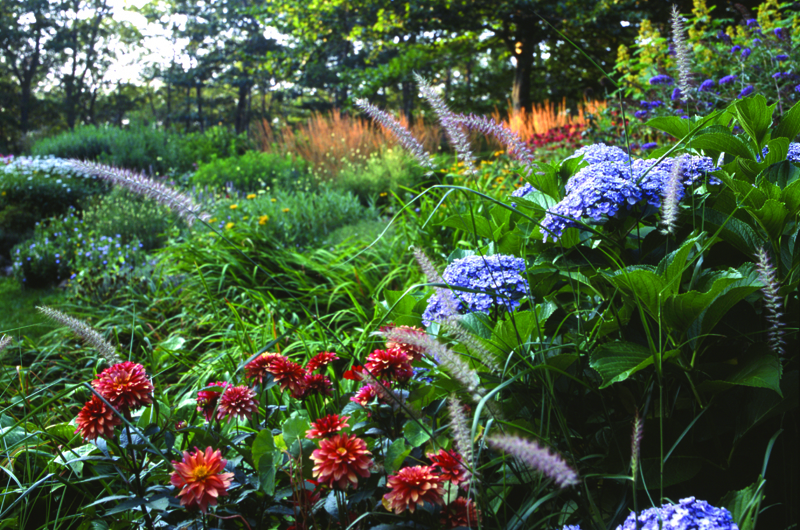 A garden is your total landscape – flowerbeds, lawns, and even uncultivated areas – and will forever evolve. You will always continue to make it your own. It will grow with you. You can do no wrong. You can change things always. You can easily move, improve the soil, add, or take away. There really is plenty of time to develop your property.